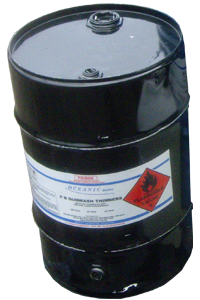 Oceanic Enviro has been servicing the Australian Smash Repair, Automotive and Industrial Industries with quality New and Recycled Solvents, and Waste Management systems since 1994. Our company is fully EPA licensed, so you are guaranteed that your company's waste products are Transported, Recycled and or Disposed of, meeting all EPA and Local Government guidelines. Product destruction of your surplus, out of date products is all fully certified to cover all your company's security concerns. EPA Transport certificates are issued in accordance with the National Online Waste Tracking System. Gunwash Machines: With a range of machines to suit all workshops from Manual to Automatic. Solvent to Aqua Based paints systems. We have the machine to suit your company. 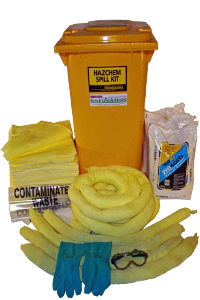 Oceanic Enviro has a full range of Spill Kits at our disposal. These are specifically designed for both Car & Laboratory kits, right up to Industrial size bins to suit most workshops from General purpose to Hazchem areas. Oceanic Enviro are able to test most waste products and advise you on the right course of action whether it be disposal or recycle and return for a cost effective re-use of the product. 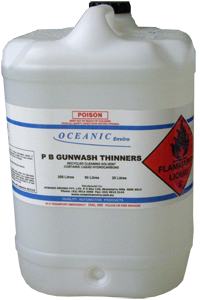 With an Australian wide re-seller network on the Recycled Gunwash Thinners, please contact us for your closest stockist.